Maurizio Guarini is a composer, multi-instrumentalist and software developer. Born in Rome, Italy in 1955, Maurizio started playing keyboards and guitar at the age of 10. He created his first band when he was 12 and started playing at high school concerts. His music exploration started with rock and then moved on to progressive / jazz-rock. After graduating from high school in 1973, he attended the Math faculty at the University La Sapienza in Rome. During those years he mainly hung out with Italian jazz/Rock musicians, performing live in Clubs in Rome. Maurizio joined Goblin in spring 1975, being part of the very first live lineup. The band’s major hit "Profondo Rosso" reached the top of the charts for a few months, and the band toured Italy for the subsequent couple of years. Maurizio left Goblin at the end of the recording of the "Suspiria" soundtrack, in November 1976, eventually re-joining, with a renewed line-up, in late 1978. He participated in the production of the band until 1983, including "Volo" (the only Goblin Pop detour experience) and several soundtracks, including "Buio Omega"' "Contamination", "Patrick", "St.Helene's" and "Notturno". Over the same period Maurizio performed as keyboard player and contributed to several soundtracks - mainly horror and thriller - including Lucio Fulci's movies The Beyond, City of Living Dead, Zombi 2 and others, among the most popular cult movies in this genre made around 1979 - 1981. Until 1990 Maurizio kept working as a performer and composer/arranger with the major artists on the scene, both in studio production and live concerts. In parallel with music activity, during the early eighties, Maurizio became interested in software development and in 1983 he realized the first midi card for Apple II ever made, named YUK. For a few years Maurizio used this software in studio, live and commercial recordings. YUK was used at that time in studio by several acclaimed musicians and bands, including Mahavishnu Orchestra. Software development involvement grew over the years, and expanded to non-music related applications. In the early nineties Maurizio earned a Bachelor's degree in Computer Science. In 2003 Maurizio was contacted by Goblin bandmates Massimo, Fabio and Agostino with the idea to restart the Goblin adventure. As a result a reborn band Goblin, named BackToTheGoblin, ended up releasing the album BackToTheGoblin 2005, in February 2006. Maurizio took the opportunity to found the record label BackToTheFudda to produce and distribute music online. In 2007 Maurizio in the need of start performing live again, founded a trio with two Canadian musicians. The trio, initially called Goblinia, performed live (mostly Goblin tunes revisited in a more experimental perspective), then evolved into Orco Muto, and expanded its repertoire by adding some original compositions. 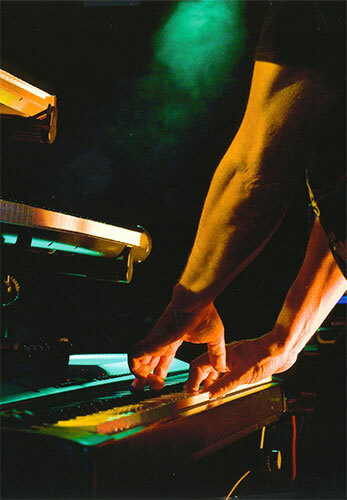 Orco Muto is mainly a live band, and performs mostly in prog/horror events and festivals in North America. In the meantime the reunited Goblin finally decided to hit the stage again, after more than three decades. The resurrected band put together a new show and did an European tour in 2009. The band split again in December 2009, and just three months later Maurizio and Massimo invited Claudio Simonetti, original founder of the band, to re-join. In late 2010 Goblin started touring again with this new line up. New Goblin has been touring Europe, Japan and Australia with great success. Two live albums have been released since, one recorded live in Rome and one double DVD recorded in Tokyo, both in 2011. In 2012 Maurizio wrote a score for Tophet Quorum, an episode of the movie "The Profane Exhibit". In the meantime, while still touring with New Goblin, Maurizio has focused on his first solo album, "Creatures from a Drawer", a collection of tunes he composed over the years. Part of the album is totally electronic, part has been performed with the collaboration of Canadian musicians. The album was released in January 2013, and is available to buy online on the backtothefudda store. Live performances kept being the main activity in 2013-2014, with Goblin back in Europe, Japan, Australia, New Zealand and finally, in October 2013, crossin the ocean for the first North American Tour ever, with 45 concerts between US and Canada. At the end of 2013 Goblin line-up changed again, with Claudio leaving an Fabio and Agostino back in the band. Maurizio - that in all these years never adandoned software development - started researching and experimenting a protocol to interact in virtual worlds like second life playing virtual instruments created by the fantasy through real midi instruments. A preview was presented on an installation in Meaford, Ontario, in Summer 2014. Second part of 2014 was focused on the production of the new Goblin album, Four of a Kind, released in 2015. Development of virtual world contents, involving VR as well, continued in 2015. On the music side Maurizio worked on the production and the release of Goblin Album Austinato, a live performance recorded during the third leg of US tour. In 2015 Maurizio started participating as a guest to several horror / film conventions in North America, including the San Diego Comic Con in July. In 2016 Maurizio started a new live project, called "Maurizio Guarini Circle". The main goal of the "MG circle" is playing live with a variable groups o musicians, time by time having other musicians as guests. The first live appearance was in April in Toronto, as opening act for the prog rock band Magma, followed by other shows in the Summer. In the meantime Maurizio started composing the soundtrack for a spoken word rendition of the novel "The Raven", by Edgar Allan Poe, released on Vinyl. Experiment went very well, and was immediately followed by another soundtrack, for "The Yellow Sign", by Richard Chambers, that Maurizio put together later in 2016 and was released in early 2017. 2017 was focused on production of reviewed old stuff and live activity, both as solo and as part of Goblin, with a Summer Europe tour and the fourth North American tour that took place in October/November. The new solo project, still under the name "MG Circle" will be something innovative and unexpected, but Maurizio prefers to keep it secret up to the last minute. First quarter of 2018 was focused on music composition, including refinement of the new project, and production of a new Goblin Studio Album, "Fearless", released for the 40th anniversary of Dawn of the Dead soundtrack. Goblin live activity was limited to a performance in US. In the meantime, in Summer Maurizio started a tour bringing to theaters a live score for a silent movie from 1911, "Dante's Inferno". This event had started in April 2017, followed by some performances in Canada, and Maurizio was asked to do it in other venues in North America.